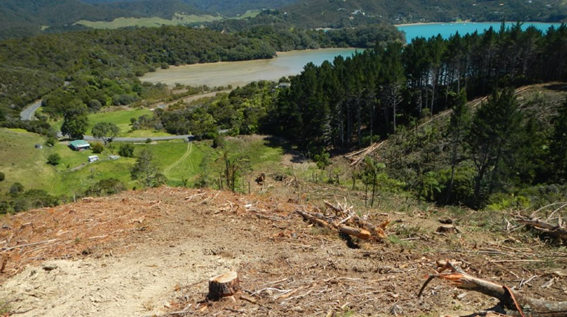 Recently, in a new initiative, the Northland Health & Safety Forestry Group made a series of forestry awards to recognise and elevate the good work done by industry participants. The winner of the Outstanding Environmental Management award was Shane Maxwell, the foreman of Kohurau Logging who were engaged in a difficult harvesting job in the Bay of Islands. The particular site involved moderately steep hill country in heavy clay soils that was bisected by a permanent stream that flowed directly into the shallow Omakiwi Bay, an area important for shell fish. The hills dropped right down to the public road edge that in places was effectively the margin between the forest and the coastal zone. The forest also involved sites of significance to Maori and was complicated due to the presence of powerlines. In the course of the operation the crew and staff agreed on a careful plan to bring the felled trees across the small stream with minimum disturbance to the banks, the well-developed native riparian vegetation and in particular the quality of the stream water which was being monitored on a regular basis by one of the forests neighbours. Shane took great interest in ensuring and achieving the high standards that were required for this job. PF Olsen’s Northland Branch Manager, Peter Bullen, says the award was well-deserved as the results achieved in this complex site were right on target! The Omakiwi operation – still in progress. The tops of the riparian trees and associated stream are just visible in the middle left. The stream passes into a small wetland before draining into the bay.